I grew up in a time when riding a bicycle just was; before it got reinvented as a sports and recreation thing. I recall those days with such fondness. 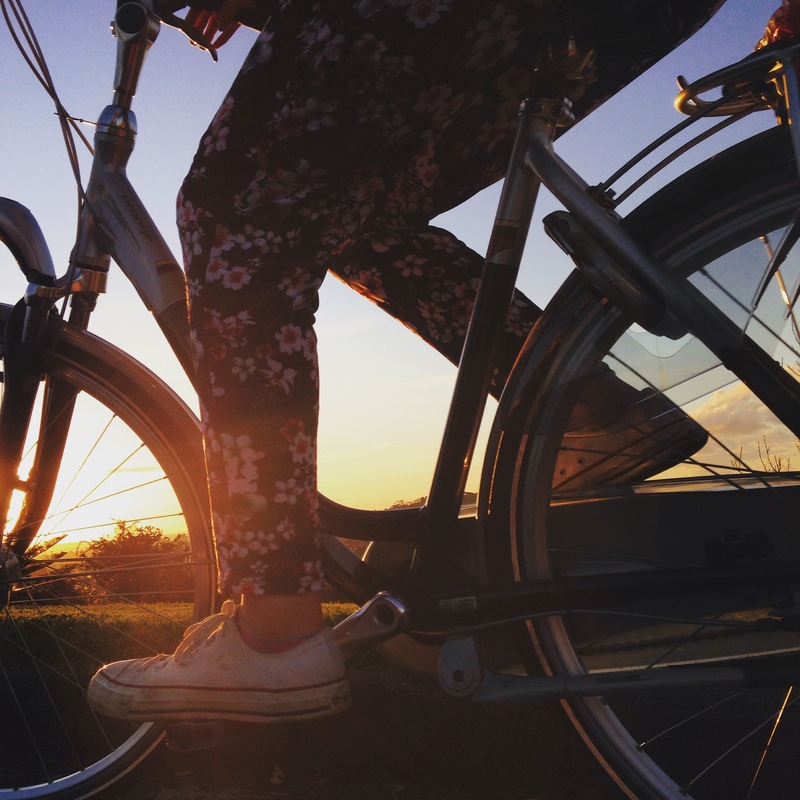 The bicycle was a pathway to independence and life experiences. We are depriving this experience on a growing number of generations. And even with the best intentions, my family are overly dependent on household car. I have had to go out of my way to recreate that experience; an experience that previous generations took for granted. It’s going to be essential to recreate that sense of value that the bicycle can bring to individuals and society. We are going to have to be creative and strategic in reversing the trend. Riding a bicycle needs to be presented as something that is a normal but life affirming thing to do. A wheeledpedestrian in Seattle on the 4th of July. Guest Post: Dale Wambaugh of Seattle has taken up the invitation to share his #wheeledpedestrian story. Thanks Dale. You can read more of Dale’s bicycle adventures here. Fireworks are a big part of the 4th of July celebration in the USA. The fireworks display in Seattle draws hundreds of thousands of viewers in every possible spot with a view of the lake. Unfortunately, I was required to work a 4-11pm shift in downtown Seattle. The display was due to end at about the same time as my shift, which meant traffic gridlock of epic proportions and streets full of drunken celebrants. That meant only one thing…B-I-K-E! It was also the hottest July 4th on record at 92F/33C and I wanted to arrive at work fresh and rested. So, I took advantage of the bicycle racks on the front of the Metro Transit buses. The bus stop is just two blocks from my home and I was dropped off just 1/2 mile from work. It worked perfectly. I got to work in plenty of time and the bus fare was just $2.50. A phenomenon of events like this is that the crowd assembles over a period of several hours, but when the show is over, they all leave at once. 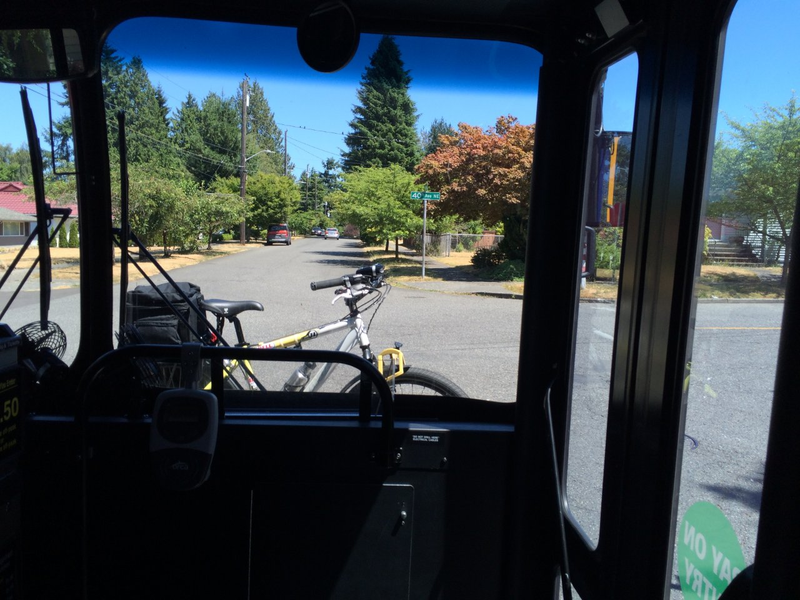 Seattle’s Burke-Gilman Trail would be perfect for the slow and gentle ride home. It’s a great rails-to-trails bicycle path that runs from the north end of Lake Union into the northern and eastern suburbs. It passes within 2 miles of my home. My initial path from work took me quickly through some downtown side streets and into the maw of the retreating crowds. I had my helmet light blinking, my handlebar-mounted headlamp on full, two tail lights blinking away and a bell at my left thumb. Every intersection was being controlled by several police officers and traffic was so gridlocked that moving through with a bike was easy. My route north to the trail was along the west side of the lake. People were walking back to their cars and many were tipsy after an evening in the heat waiting for the fireworks. They wandered around the parking lots, blocking traffic. This made it easy for me to pick my way through the stalled cars, laughing and shouting every time I rang my bell. I continued across the Fremont drawbridge and connected with the trail, passing Gasworks Park along the way. This park was a main viewing area on the lake of the fireworks display but most people had left by the time I passed by. The path was clear enough for full speed travel…just a few miles more and I would be home. You are invited to share your own wheeled pedestrian story. Calling all Wheeled Pedestrians! How are you doing? I’ve decided to, figuratively speaking, lick my finger and hold it up to the breeze to try and get a gauge on how things are progressing. So I’ve decided to throw out an invitation, both here in New Zealand and abroad, to anyone who embraces the ‘wheeled pedestrian’ philosophy. If you’ve got a story to tell and would like to inspire and/or educate others, here’s your chance. Send it to me and I will publish it on this site. A time of reckoning is near. Orpheus Drive as it is now. 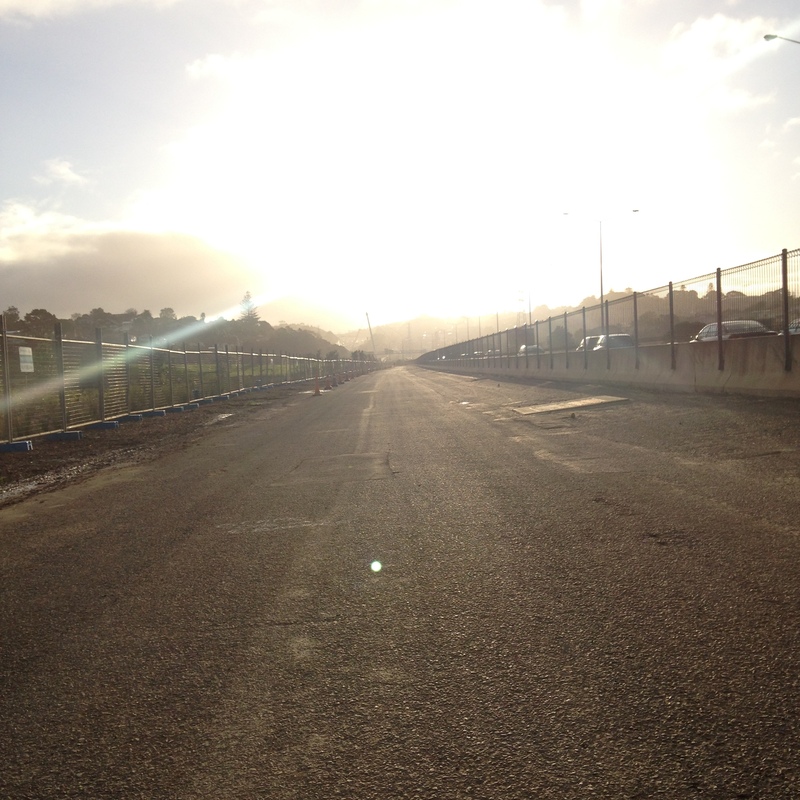 The remediation project on Orpheus Drive is nearing completion. A new shoreline has been created with a focus on passive recreation. 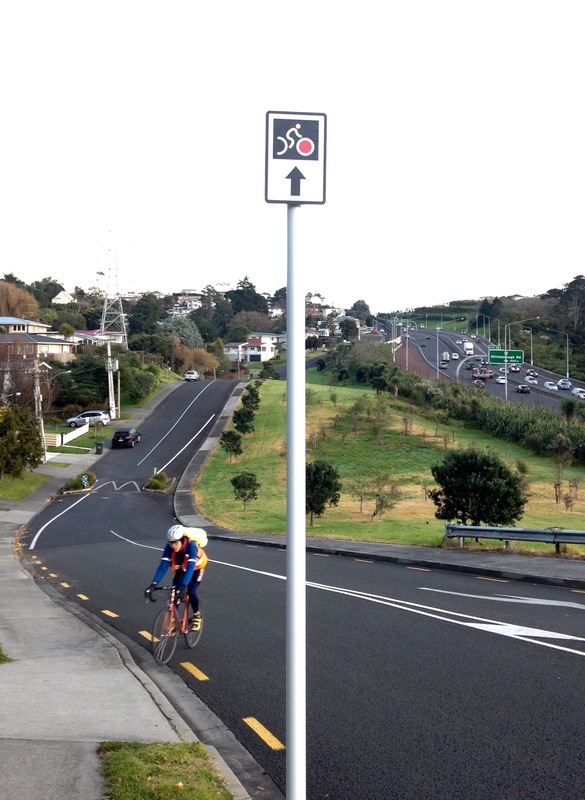 Orpheus Drive is a section of the bikeway that runs parallel to the southern motorway from Mangere Bridge to Mt Roskill. 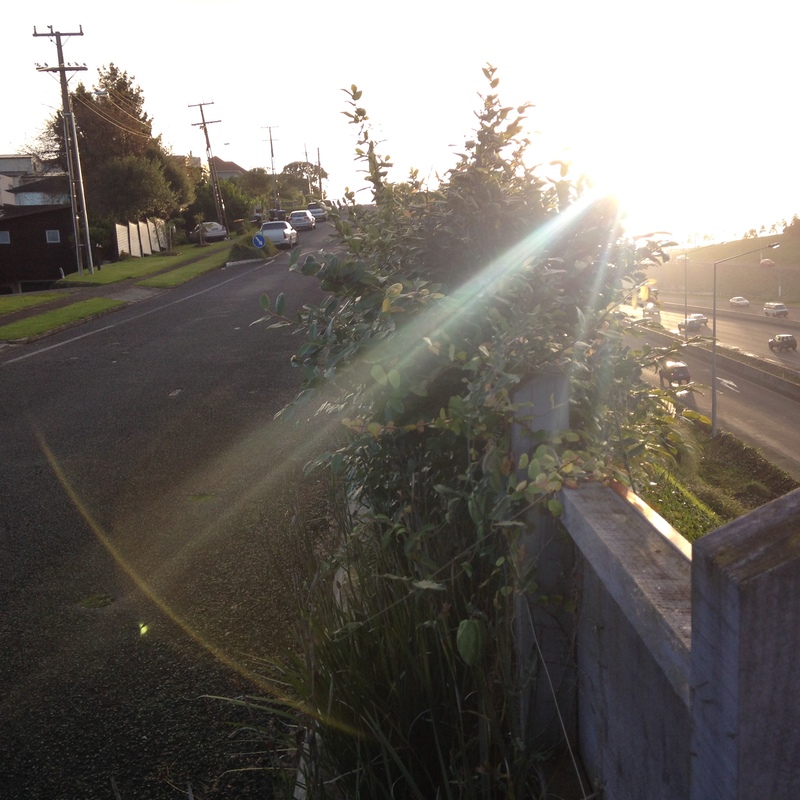 The Mt Roskill section will be completed when the new motorway gets built. The Hendry Ave section gives the term bikeway a bad name. A new shared-use path is being installed along Orpheus Drive, apparently. I hope it is more user-friendly than this section. Before the construction started, it was pretty much a ‘rat run’. So apart from having to share it with the construction crew, it has been a fairly pleasant stretch of bikeway for the duration. Cars will be returning shortly. That’s for sure. A big car park is currently being built. But does Orpheus Drive need to return to to being a ‘rat run’? Motorists have survived without it for the last couple of years so now would be a good time to engineer in some features to deter that from happening. Will some thought be given to slowing motorists down in order to improve the safety (real and subjective) of the non-motoring users? The speed bumps that are currently there, do little to deter speeding motorists. For me, the upgraded Orpheus Drive will be a test of how far we have come at putting people before cars. Unsatiated: eight lanes is not enough. The sign says that Hendry Ave is a ‘bikeway’. If it’s not about cycling, what is it about? There’s a story waiting to be told. It’s not about me, or you. It’s not about how individuals choose to ride. It’s not a personal issue at all. In fact, it’s not even about cycling. It’s about better cities, mobility, transport equality, making roads safe for all road users. Once that has been established, it’s about choosing strategies that will help turn those goals into reality. The bicycle is one of the potential solutions to building a better city. It’s a transport tool. Not to be confused with a sports and recreation tool. 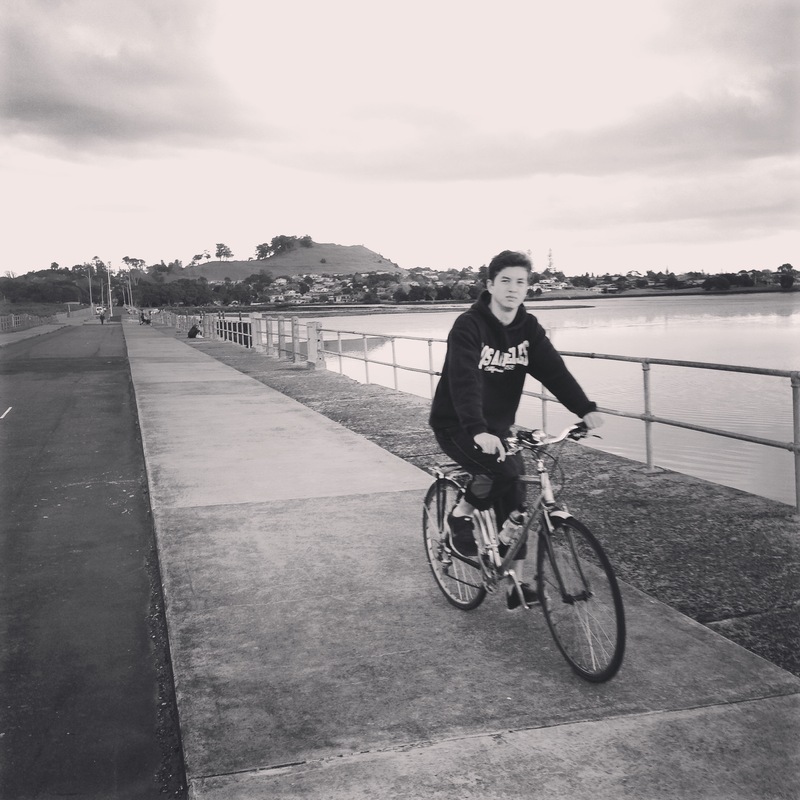 Effective advocacy can convince risk averse politicians and a sceptical public, that urban cycling is worth investing in, even if they personally don’t want to do it. Every action needs to be predicated on those goals. 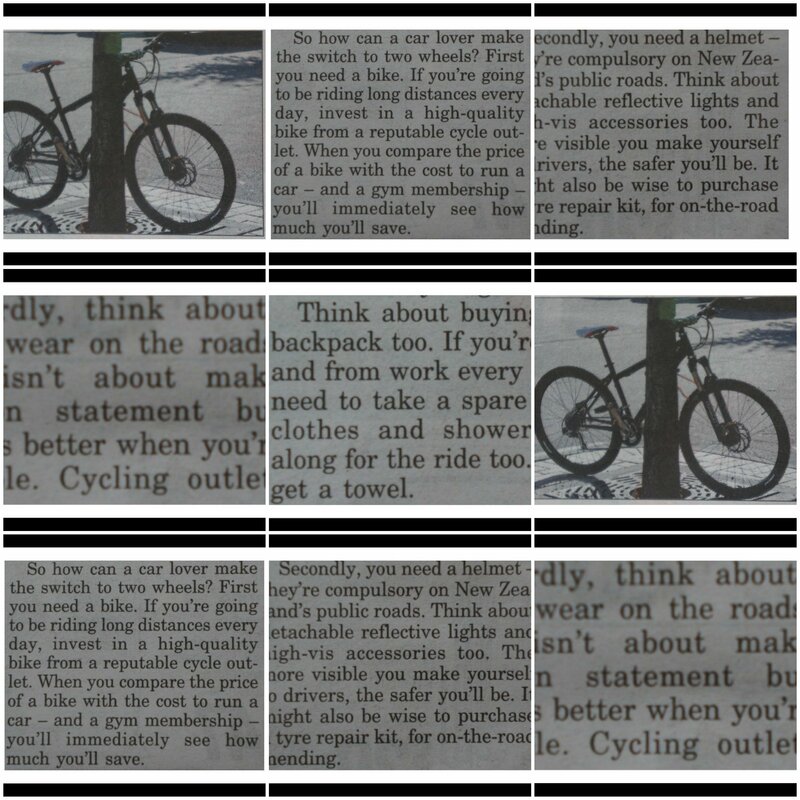 Put the passion for ‘cycling’ in a separate box and start speaking in a language that the uninformed will understand. That will require the involvement of people with a wide range of expertise and interest. A ‘building a better city’ team. It requires nuance and an ability to embrace contradiction. How do you get more people cycling without focussing on cycling? How do you make something that is so life affirming to be so common and normal?